Sail away into the sunset on a luxurious lake cruise! 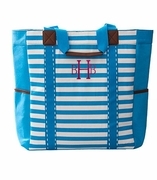 This stylish tote exudes elegance and class with a classic nautical design in narrow and wide navy blue and white stripes. The words ‘Lake Life’ are printed onto the front panel in stylish blue cursive lettering. 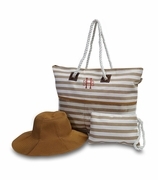 The look is completed with white twisted rope handles that thread through silver eyelets. The tote is spacious enough to pack a towel, sunscreen, sun shades, water bottle and camera to snap photos of the scenic views. You are set to sail! Pair with a frilly cropped white top and ripped designer jean shorts and step onboard.